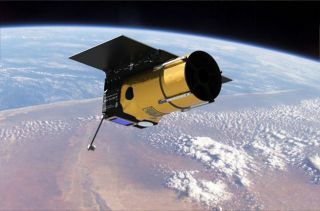 Artist's concept of the Arkyd 100 space telescope being developed by asteroid-mining company Planetary Resources. The asteroid-mining company Planetary Resources recently raised more than $20 million in venture funding, but also had to shut down a crowdfunded space telescope due to a lack of financial interest. The $21.1 million in "Series A" money will be used for an Earth-observation project called Ceres, which Planetary Resources said will use infrared and hyperspectral sensors to help manage natural resources on Earth. "While typical satellite imagery provides only a picture, Ceres will provide actionable data with higher spectral resolutions — going beyond what the human eye can see — by measuring thermographic properties and detecting the composition of materials on Earth's surface," Planetary Resources representatives said in a statement. In a separate announcement on the crowdfunding site Kickstarter, however, Planetary Resources said it will not be able to continue with a special public-access version of Arkyd, which received $1.5 million in funding from individual backers through June 2013. All people who gave money to that project will receive a full and immediate refund. The public-access telescope was intended to look at science targets chosen by the public, and included rewards such as space "selfies," in which backers' pictures would be photographed by the instrument while in orbit. "Aside from all the progress we made in the underlying technology, the follow-on interest from the business and educational sectors to expand the Arkyd campaign into a fully supported mission did not exist as we had anticipated," Planetary Resources representatives said in a post on Kickstarter. "We have explored and exhausted a variety of opportunities big and small for the financial backing necessary to complete the project." As for Ceres, Planetary Resources said the technology will first be demonstrated in space aboard the company's Arkyd 6 spacecraft, which is scheduled for launch this year aboard a SpaceX Falcon 9 rocket. The Series A funding was led by Bryan Johnson and the OS Fund. Other backers include Google's Larry Page, Idea Bulb Ventures, Tencent, Vast Ventures, Grishin Robotics, Conversion Capital, The Seraph Group, Space Angels Network and a group of investors from Angel.co, Planetary Resources representatives said. Planetary Resources plans to mine asteroids when doing so is technologically and economically feasible, the company has said. For the moment, the company said it is focused on developing its technology and using telescope surveys to identify and characterize asteroids that could be suitable targets for mining.